After some time I got finally back to good old 5th edition of Warhammer Fantasy Battle. During recent few months this one – against Empire – is my third battle and, this is something, my third win. And in the same time – I played several battles of WHFB 8th edition and I won only one. So if you ask me why I prefer 5th edition, you have your answer. Everything is working better for me in 5th edition. I’m more familiar with the rules and schematics of the gameplay. Even my rolls are way better! And this is crucial:). Anyway, I had great battle against The Empire led by my friend Matheo. 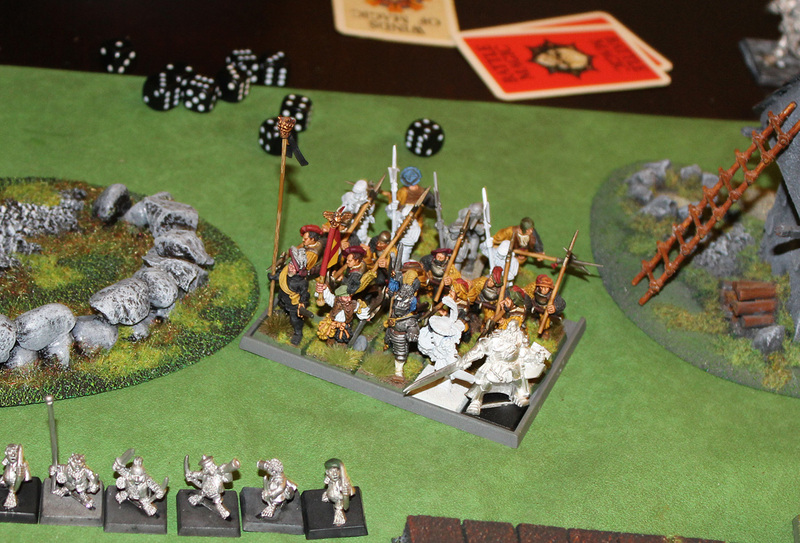 We played 2000 point and this is follow up battle of our small story of Battle of Rhoden. Here, you can read the battle report from the first game. And below the report of this battle. Enjoy! The town of Rhoden in Ostland Province of The Empire was special place. Local folks probably did not even be aware how important the area was. They were unwittingly involved into vicious and deceptive plot of vile creatures of Chaos – rat-men called by the scholars – Rattus Maxiumus or simply… Skaven. The very few men are aware of existence of Skaven, but in town of Rhoden everbody will remember those foul Chaos mutants for long, long time. At least the very handful that survived The Day of The Vermin. Ikit Claw, the greatest Skaven Warlock was sent by Council of The Thirteen to Rhoden to uncover hidden deposit of Warpstone hidden nearby underneath mysterious ancient ruins. The first Battle of Rhoden took place near these ruins. Imperial defender army led by Count Mathias von Stashek was defeated and forced to retreat to Rhoden, and Ikit Claw was able to secure the future digging site. He just wanted to connect the deposit to the web Skaven tunnels, so Warpstone could be easily extracted and transported to any place in Skaven Under-empire. Skaven Lords of Decay are ambitious and greedy. As soon as it was certain the Warpstone digging site was secured, they wanted to reach for more. Rhoden for them was teh source of gold and slaves – so why not take all? Not only Warpstone. Ikit Claw, as probably wisest Skaven alive, knew that marching for Rhoden could be risky and it’s unnecessary gamble – if Skaven would be defeated, they lost all – inducing Warpstone deposit. So, Council of Thirteen sent Grey Seer Reezulz The Horned to make sure that all of their plans will be implemented. So, Ikit Claw, not entirely happy with such turn of events, was given direct order to obey and march on Rhoden. …and in Rhoden, Count von Stashek was organizing the defence. The second Battle of Rhoden will about of begin. Matheo used the regiment of Militia Levy, which is not in official 5th ed. Empire Army Book. It was taken from 3rd edition of Warhammer . One levy costs 3 points – it has BS 2, WS 2 and LD 5, and every other statistics like normal human. Levy Militia were mobilized in a hurry by Count von Stahek to defend Rhoden. The battle was planned for 5 turns. Normal victory conditions. The Battle took place on the field on the eastern side of Rhoden. Empire army defended the town, and Skaven raiders came for the east. Empire: Ogres and Militia behind them, Crossbowmen, Halbardiers with Count von Stashek and Battle Standard Bearer, Champion Wizard hiding behind them, Halfling Archers, Helblaster Volleygun, Dwarf Spearmen, Imperial Cannon, Dwarf Crossbowmen, and off the photo on the very bottom (south) – Champion Wizard and Skirmishing Archers. Wow, this is actually amazing – The Empire fielded more models than Skaven. They overswarmed my army! Impressive! Skaven: Doomwheel, Slaves, Clanrats pushing Screaming Bell with Grey Seer Reezulz The Horned, Stormvermin led by Ikit Claw and second Doomwheel. Count Mathias von Stashek gathered together great army to protect the town. His tactics was simple. All missile units (plus Imperial Cannon and Helblaster Volleygun) held their ground and tried to cover the incoming Skaven with the rain of arrow/bolts or bullets and cannon balls. The point was – kill them as many as possible before they reach Rhoden. Tactics taken from ‘Tactica Imperialis’ – well known and used in many battle with success. So, Count von Stashek ordered almost every unit to remain at their places and shoot if possible. Only two units moved forward. 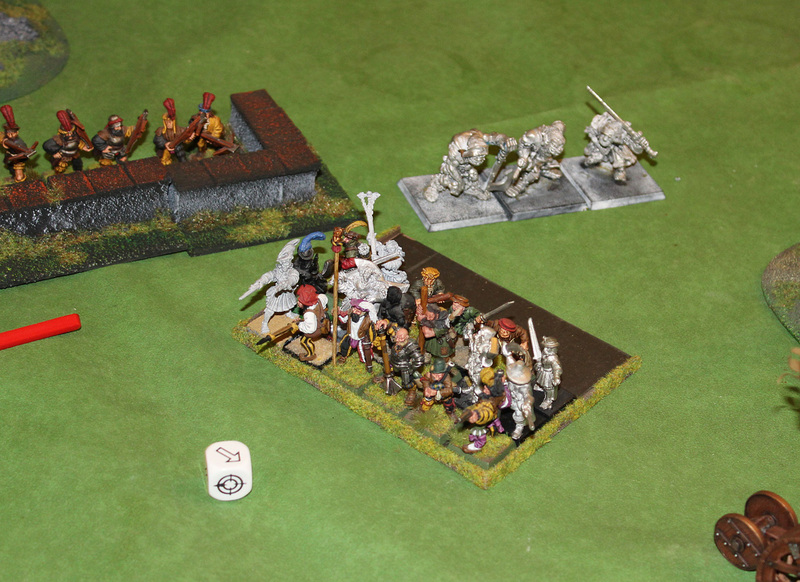 On the northern flank – Ogres marched – there was no reason to hold them back. Big, hulky and mean Ogres were so eager to taste the flesh of Skaven, so they simply almost ran towards the enemy. On the south, skirmishing Archers moved to the small forest to flank enemies from the side. On the south Archers move near the small forest. And than shooting began. Unfortunately the rain of missiles were not looking that impressive like it supposed to look. Let’s start from the fact The Imperial Cannon shot with dud – the ball was fired, but it stuck right before Skaven Screaming Bell. Other missile units killed only 4 of all incoming Skaven. Crossbowmen shot at Slaves – killed 3 of them. 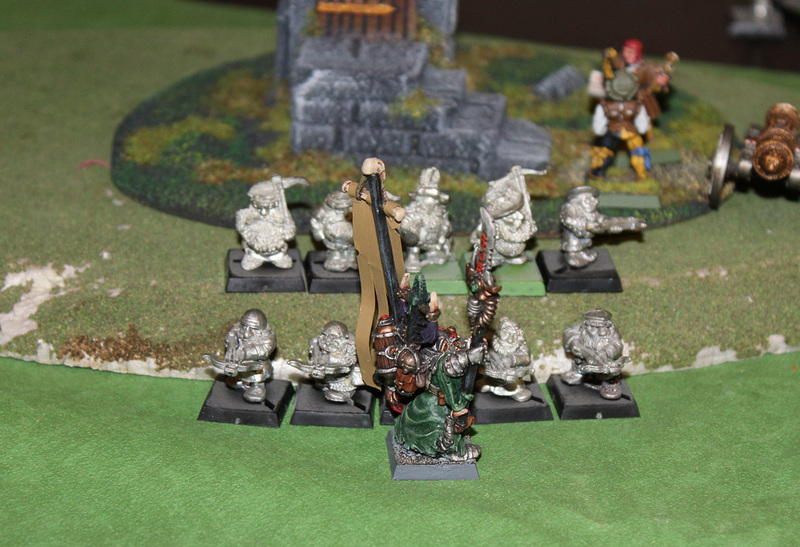 And Dwarfs shot at Stormvermin – only one of them fell dead. Not impressive salvo at all. Hopefully, when Skaven will come closer – the accuracy will improve and they will be in range in this hellish invention of Nuln Engineers – Helblaster Volleygun. The Skaven will perish. 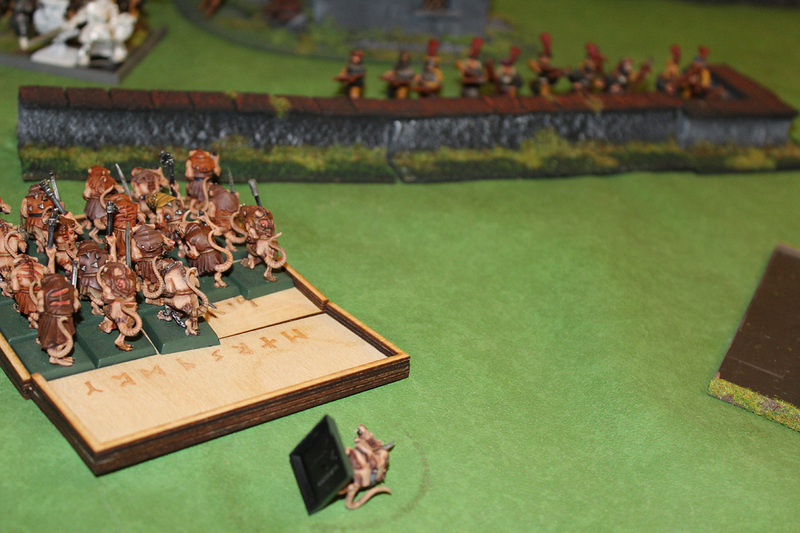 Skaven tactics were quite opposite to this used by Empire army – they rushed at Rhoden with pace. Slaves and Stormvermin marched forward. Both Doomwheels rolled down the hills and only Clanrats were proceeding little with little bit slower tempo as they were pushing heavy Screaming Bell carriage. …and Skaven army march to possible victory were announced by the sound of Screaming Bell blessed by Horned Rat himself. The Striker on the platform hit the bell with his huge double-handed hammer and the massive sound echoed over the battlefield. Skaven were ready to fight! 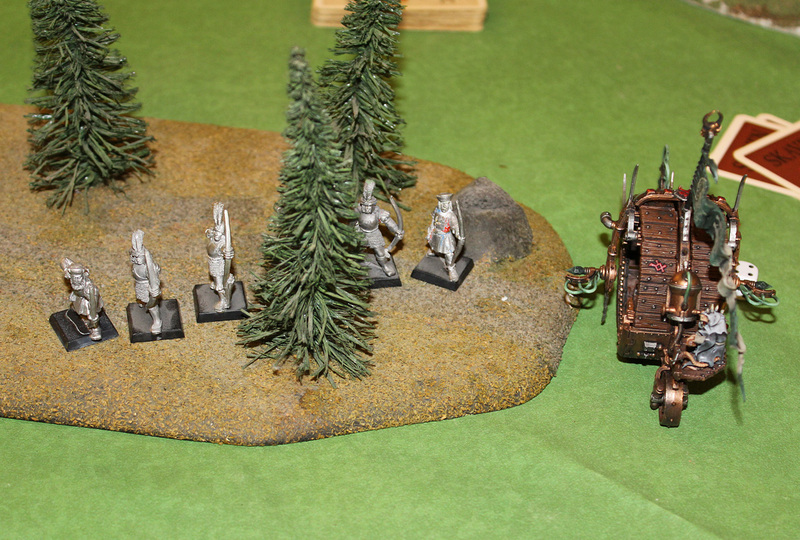 On the south flank Doomwheel rolled near the small forest and Archers trying to sneak around. Three lightnings were released and 2 Archers fell dead fried by high voltage. On the north, second Doomwheel took some really impressive speed! 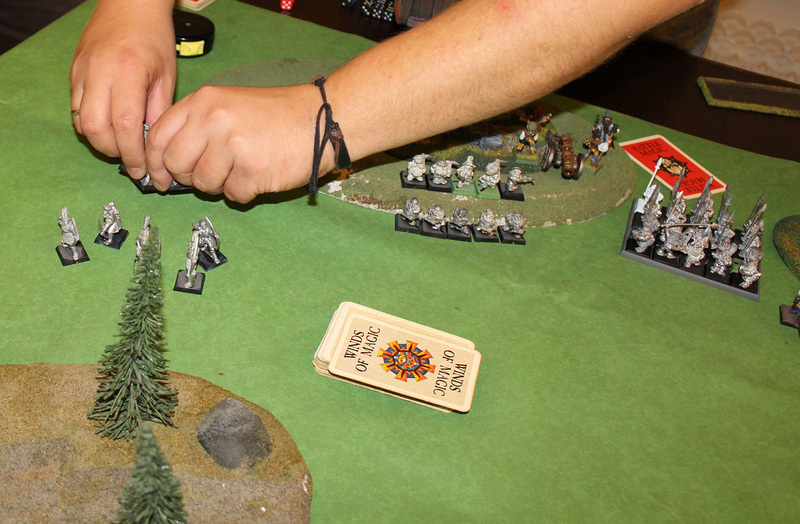 Warlock Engineer controlling the Wheel cried with crazy rage – he was closing to Ogre unit ahead of him. Doowheel firing his lightnings at Ogres. Soon-soon impact. Yes-yes! Zzzzap-zzzzzap!!!! ZZZAP! ..but first, he pushed the button to release the electric pulse from Warpstone generator and three destructive lightnings were sent directly to Ogres. Two of them died and remaining three simply panicked seeing their comrades burnt to the dust. They fled around Militia unit. Meanwhile, massive vortex were concentrating over the battlefield. The sky turned purple and unusually strong Winds of Magic were attracted by the presence of Wizards in both armies. The Wind were so powerful that Ikit Claw could barely control the power he absorbed (yay, I rolled 12 for Winds of Magic:), but somehow he managed to do it. The magical energy in his infamous Storm Daemon halberd were enormous! He decided to cast Skitterleap and teleport deep inside enemy lines. 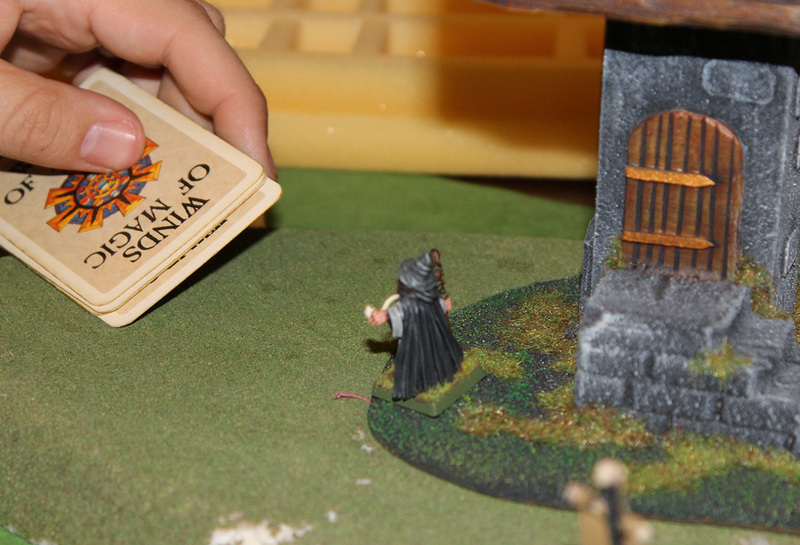 Empire Wizard’s attempt to dispel the spell was futile. He vanished in thin air and repapered direct in front of Militia regiment swinging Storm Daemon with fury. These poor peasants were no match for him! Ikit Claw teleport himself to charge at Empire Militia. 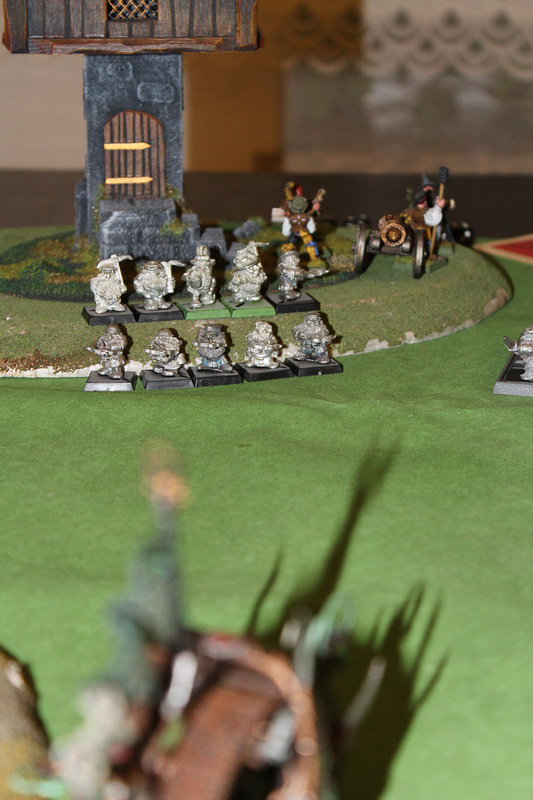 Count von Stashek was little bit surprised by sudden appearance of Skaven general on his left flank. He decided that was the time to take action into his own hands. He defeated Ikit once (in previous battle – author) in close combat, but somehow Ikit used his magical tricks to Escape from certain death in very last moment. Count von Stashek wanted to make sure Ikit will not live another day, so he stepped out the regiment of Halberdiers and move closer to Ikit Claw to seek his revenge. Give me the head of Ikit Claw. On the southern side – Archers entered the forest and prepared their bows to shoot closing Doomwheel. On north – Ogres pull themselves together and rallied. Ogres back in the game. And the second massive Empire salvo began. Bows, Crossbows, Cannon and Helblaster. They all fired. Well, and this time Imperial Cannon also misfired and the ball stuck in the ground. What happened? The old and respectable Guild of Engineers manufactured such flub? This is impossible! Something else for sure must occurred – perhaps The Curse of Skaven Grey Seer? Who knows what these cunning Rat-men are capable of? 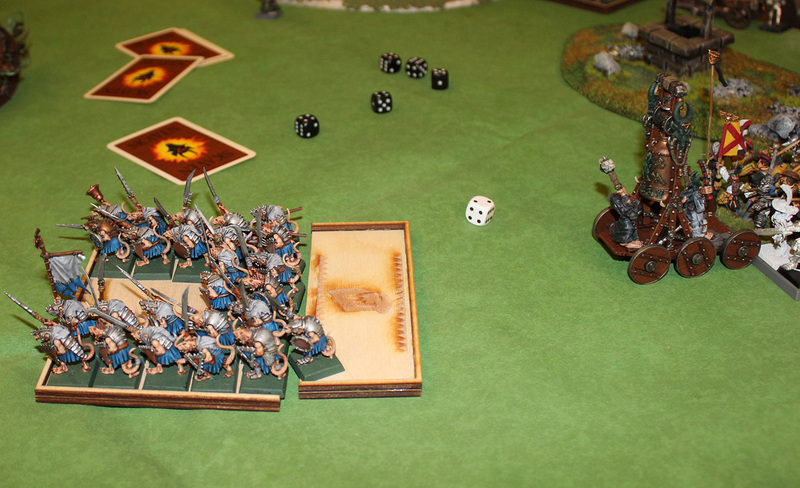 Meanwhile Halflings aimed their arrows at Stormvermin – 2 fell dead. Halfling arrows killed 2 Stormvermin. 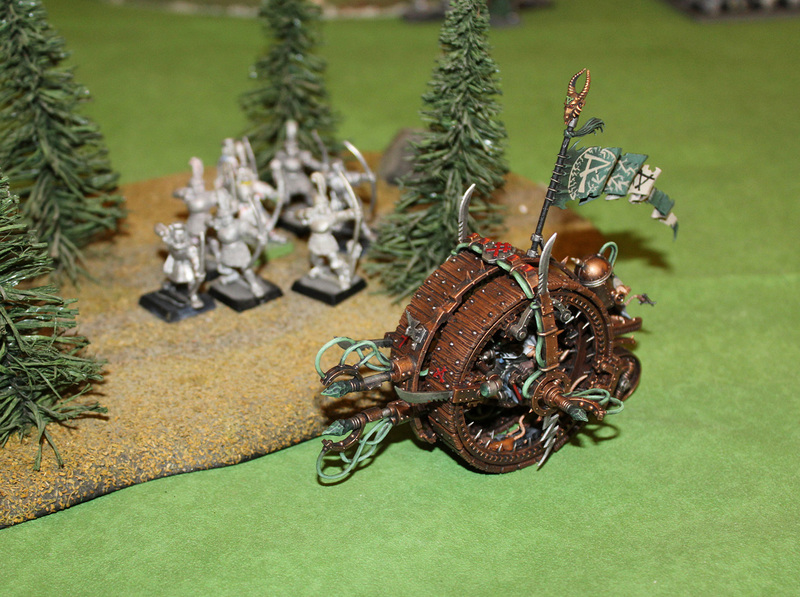 Dwarf Crossbowmen damaged a little southern Doomwheel. 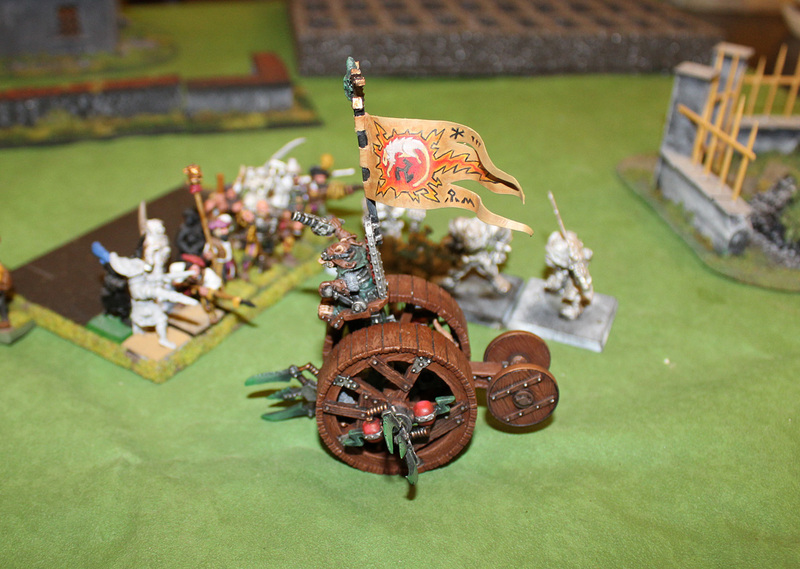 On the north, Empire Crossbowmen released their bolts at Doomwheel. Most bounced off the strengthened wooden construction, but one bolt hit Warlock Engineer direct into his heart killing him instantly. Doomwheel lost its controller! The machine’s movement will be even more erratic and unpredictable. Ikit Claw seemed satisfied, that Empire Artillery performance was at least mediocre. The battle plan was implementing perfectly. He easily killed three of man-things Militia around him. Annoying weaklings. Skaven were much superior race and will overcome. Lucky for Militia, they had strength in their numbers and their regiment ranks. Ikit Claw will be bothered by them little bit longer. The Screaming Bell rang second time this day. The vibrating sound travelled across the battlefield – every wooden and metal construction shaken. War machines around remained intact, but the tremor was quite disturbing. 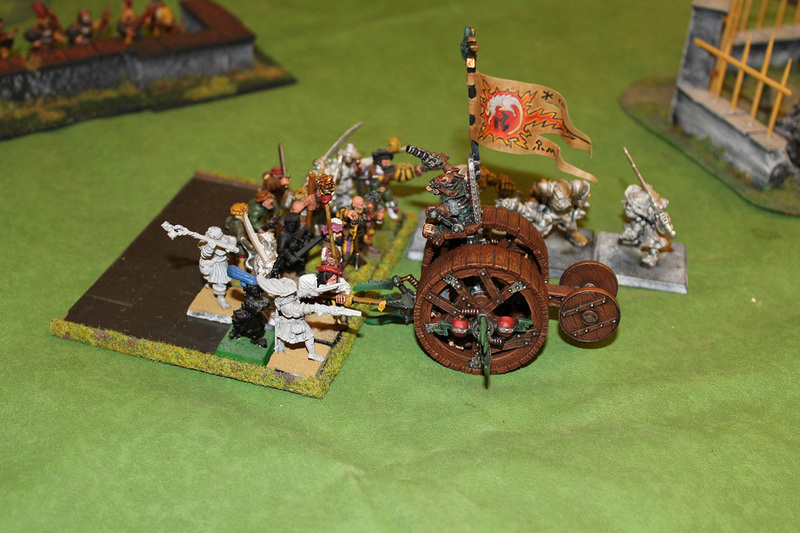 All Skaven units marched forward… and Doomwheels’ next move were impossible to guess. First, southern Doomwheel was temporary out of control due of slight Warpstone Genrator failure. It moved along the line of trees and released three lightnings direct into the wood. Two Empire Archers hidden behind the trees were burnt to death. Look out! It’s out of control! Ikit Claw was swinging around his halberd with fury. Two peasants were killed by his mighty blows. They still outnumbering Ikit and held their ground. Ikit did not care about overwhelming enemy soldiers around him – he saw too much during his journeys across the world to be bothered by such puny man-things. In the same time Reezulz The Horned tried to cast Plague at unit of Halflings. They looked so fragile and inclined to diseases, that temptation of casting this spell was too high. However one of Empire Wizards shook his Skull Staff in mysterious rite and said the invocation of Destroy Spell. The spell was dispelled, and almost annihilated. Grey Seer in very last moment managed to hide the words of Plague spell deep inside his wicked mind from destructive dispel . Count von Stashek was annoyed. Ikit Claw – his nemesis – evaded him once again! How many times it is going to be? Why Sigmar denies him a vengeance? Why some grim daemonic Chaos gods laughed at him direct in his face? WHY? He turned back and rejoined regiment of Halberdiers, and together hey get in the middle of battlefield – preparing for closing foe. 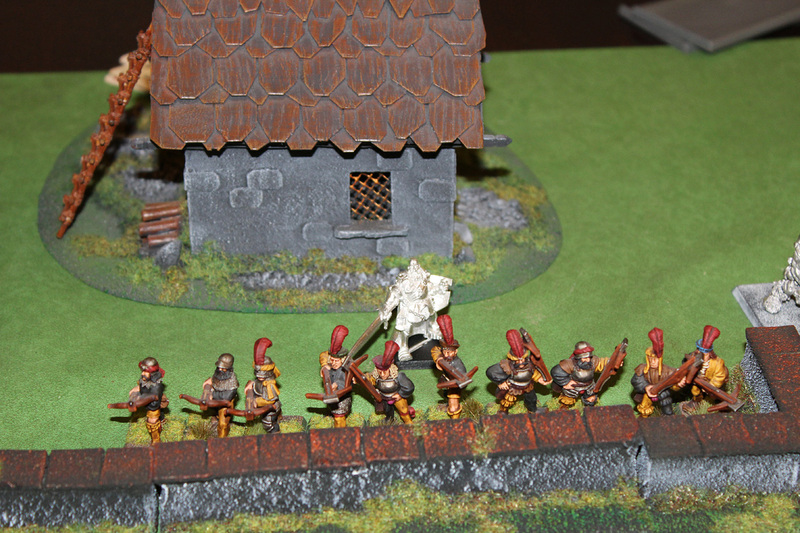 Count von Stashek rejoins his regiment of Halberdiers. On the south, Archers secured their position in the forest, and on northern flank Militia and Ogres moved closer to Skaven Slaves. Militia and Ogres after Skaven Slaves. Other regiments remained still (beside Helblaster Crew who tried to find some safe place to hide). 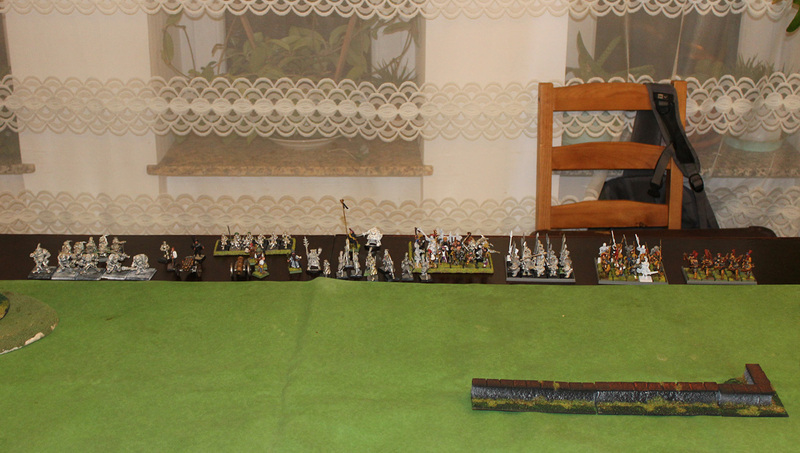 Crossbowmen and half of the regiment of Halflings, together they shot 6 Slaves. Not enough – they still were going to in Empire defence line direction. 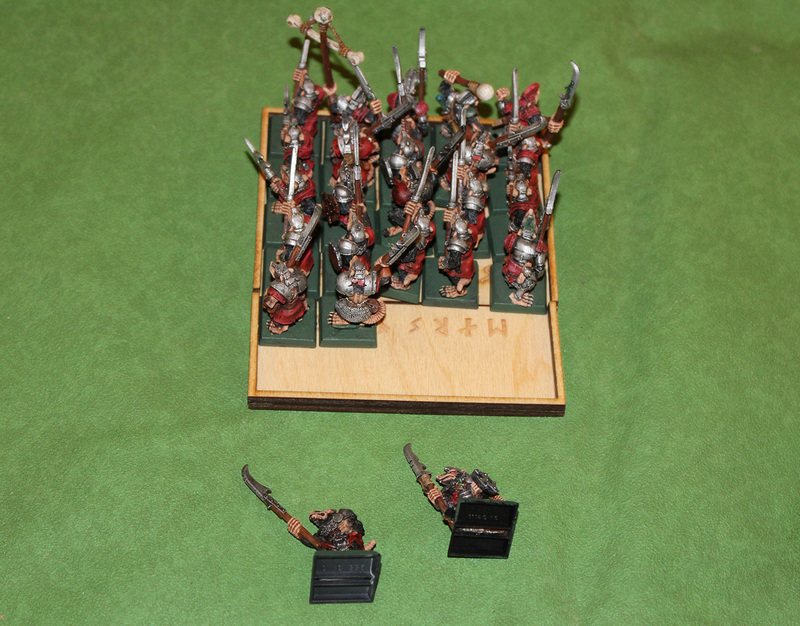 Second half of Halfing Archers shot at Stormvermins – and 3 of these elite Skaven soldiers fell down pierced by arrows. And Dwarfs Crossbowmen were engaged by Ikit Claw. Ikit was right about Dwarfs. They were more demanding, when it comes to close combat. He killed only one Dwarf-thing and they actually fought back! One of the ‘shortys’ put the dagger under the Ikit’s robes, but lucky there was Warpstone Armour which took all the impact. Adrenaline in Ikit’s veins went high! This is what he needed – the enemy that is able to fight like Skaven! When Winds of Magic were starting to concentrate above battlefield, one of Empire Wizard reach for the magical power necessary to cast Bless spell and started to whisper the words… However Grey Seer Reezulz The Horned thought that man-things sorcerers do not deserve to cast spells at all. This was abomination and insult to Chaos gods who created all magic. So, he counteracted by creating powerful vortex that literally Drained all Magic from the area. The Wind of Magic were blown away. The sky all of the sudden became silent and devoid of all energy. Wizards won’t be able to cast spell any time soon. For Emperor and his gold! 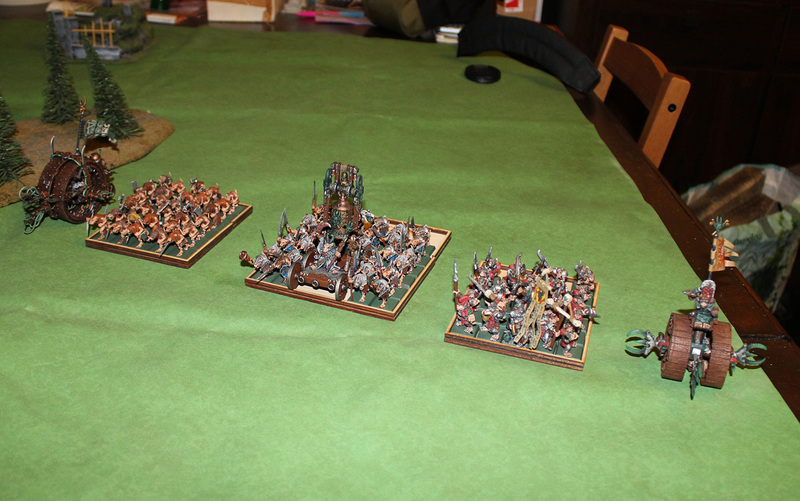 …and prepared their spears for incoming Skaven. 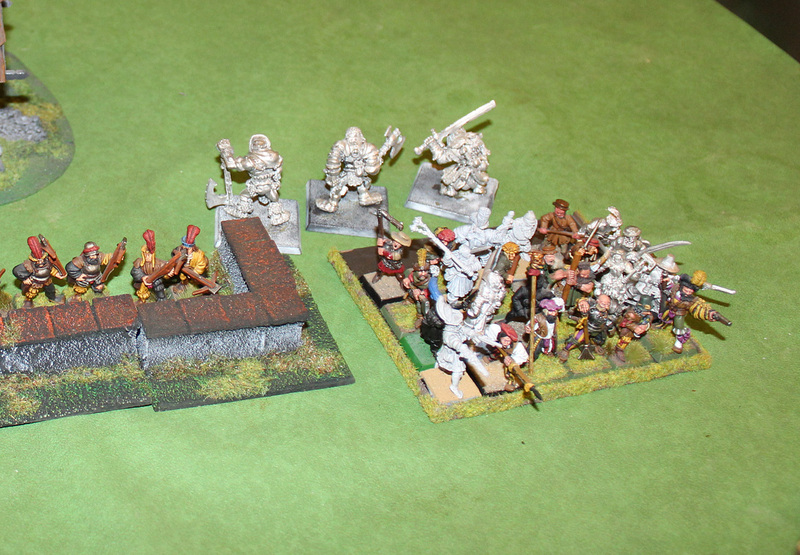 Skaven Slaves also charged – unit of Halfling Archers. Maybe it’s impossible to accuse Halflings of being cowards, but they are caution creatures. Well, bows are the best weapons for them – not swords. So, they calculated their chances in close combat engagement and… they fled as fast as they can. And it paid off, because Skaven Slaves did not manage to caught Halflings. Good, pragmatic thinking. 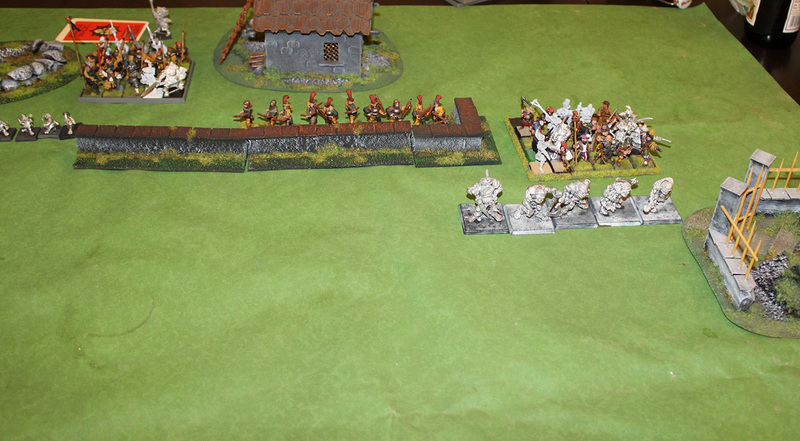 Halfling flee the charge of Skaven Slaves. At the same time – southern Doomwheel moved around the forest and Archers hidden behind the trees trying to take down the Engineer with their arrows. And on the north, another Doomwheel – the one without controller driven only by the power of small rats feet inside the wheel, suddenly turn back and fired three lightnings at Militia. Two off them were killed at sight. Northern Doomwheel out of control! Ikit Claw continued to showing off his close combat skills – he mastered the art of halberd fight during his long travel to Cathay. Nobody could match against him when he was swinging his Storm Daemon. And for sure, not these pathetic Dwarf-things. He killed with ease 2 more. Stomvermin ran like hell with halberds pointed defending Dwarf regiment. The impact was terrific. Both sides clashed together in combat. 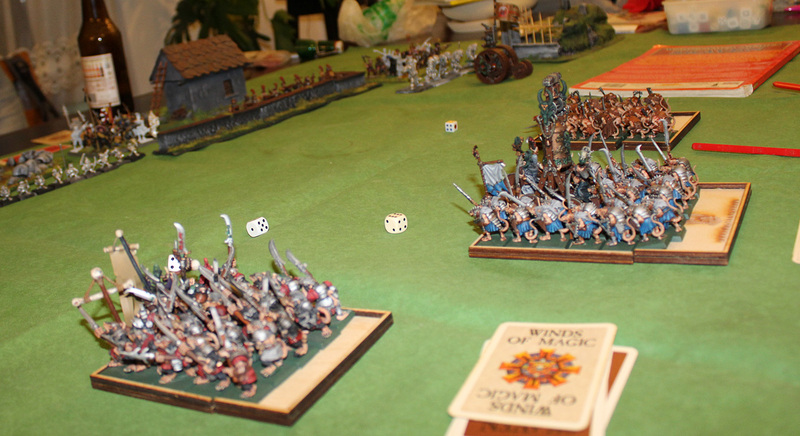 Dwarfs were striking with their spears and Skaven cutting with halberds. Two Dwarfs and only one Skaven fell – Dwarfs morale did not broke though – they held their line and Stormevrmin started to surrounded them from the flanks. Grey Seer and The Screaming bell was close to Empire line. Not close enough that his faithful Clanrass could spill the blood of man-things, but actually close enough to cast one of most powerful spells in all Skaven Magic – The Plague. The potential of the spell was huge. There were whole armies that were dying in horrible spasms, mighty heroes that could not survived the bloody fever. The Plague treated everyone equally – it was killing all – men, Dwarfs, Halflings and even Skaven. The Curse of Clan Pestilens was horrible and unstoppable if casted. Or maybe could be stopped? The first of Halberdiers became infected with this deadly disease. He could noticed abscesses popping on his arms, he started to vomit horribly… but he was still standing! The pain was enormous but he survived! The Plague was harmless this time! Grey Seer Reezulz The Horned could not believe it – his spell had no effect. Not even one man-thing was touched by this magical pestilence. Curse on them! Empire defence line was broken. Fleeing Halflings unit made giant whole. So, Count von Stashek and his Halbardiers moved to the middle of the battlefield to fill the gap. 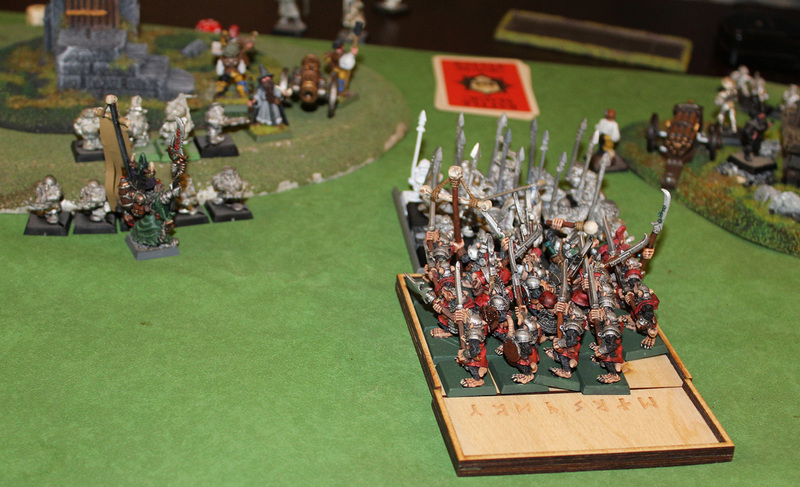 Thankfully Halflings rallied, regrouped and started to prepare their short bows for releasing one more set of arrows. Meanwhile Ogres and Militia on the northern flank charged uncontrolled Doomwheel – it was to dangerous to left it intact. Nobody could be sure where it could move, so it could possibly roll into any of Empire units. The machine needed to be destroyed. On the south archers moved closer to other Doomwwheel. Kill the driver – that was their task. Easy to say, harder to deliver. They shot – all arrows rebounded from wooden wheel construction. 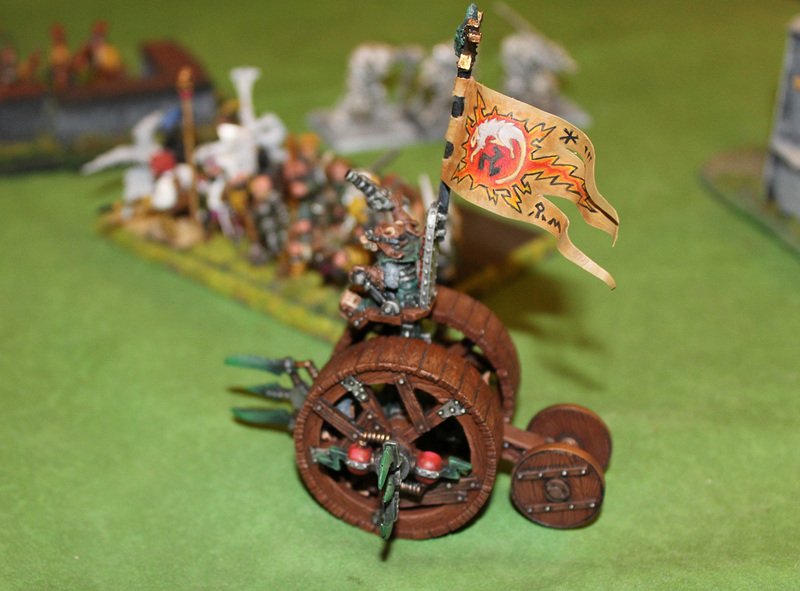 Skaven controller was hidden safely inside the wheel’s mechanisms and cogwheels. …nothing happened. No shot, no fire blast, not even slightest sound came from the cannon. After closer examination, the crew noticed that ball stuck inside the cannon – and to shoot again, they need to take it out and reload. The work for at least an hour. They were literally the most unlucky artillery crew in whole Empire. Three misfires during one battle – not even one shot! Can you imagine that? One Skave slave fell dead pierced by crossbow bolt. While Slaves were trying to get into close combat, Stormvermin, elite troops of Under-empire were already in action. 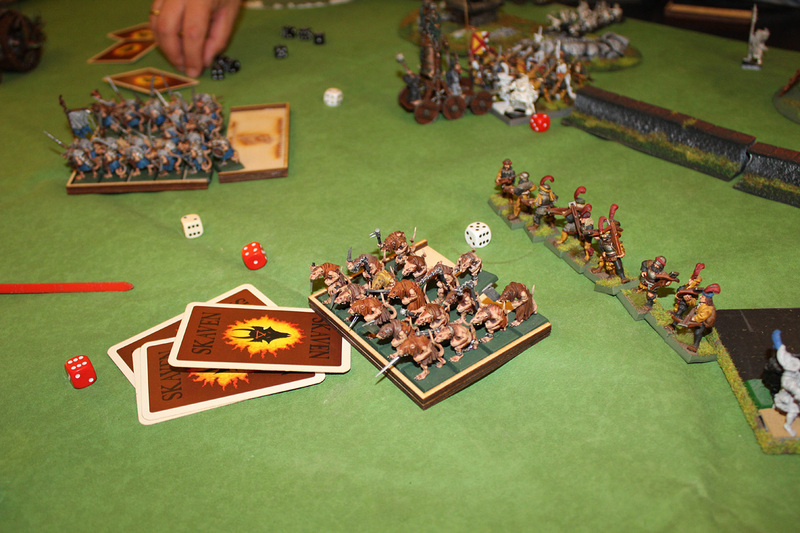 Fierce clash against Dwarfs were getting into decisive moment. Dwarf regiment was slowly surrounded from the flanks by Stormvermin. 2 of these brave Empire warriors were killed, and they couldn’t kill back any of the vicious Skaven. And Skaven continued to overswarm Dwarfs, who couldn’t handle this awful situation, lost their nerves and fled. Naturally Stormvermin pursued and wiped out all fleeing Dwarfs. No one was left alive. Stormvermin left the battle and entered the city. They could start toloot and burn already, but they were disciplined soldiers. They will be back to fight against Imperial troops soon. Annihilation of the Dwarf unit did not go unnoticed by some. Crew of Empire Cannon simply panicked! The Skaven entered the city! It’s time to retreat! Unfortunately Empire General was too far to boost their morale, so they left the cannon and fled the battle. Looking at this – Empire Wizard thought: What am I doing here?! I’m a scholar, not a warrior. My place is back at dean’s office at Altdorf’s University. Not here… and he also left the battle. Empire morale definitely was getting low. To heel with this! I’m going back to Altdorf! – said the wizard and left the battle. At the same time Ikit continued too fight another unit of Dwarfs. They had not a slight chance against him, but they fought bravely, and hold their position. 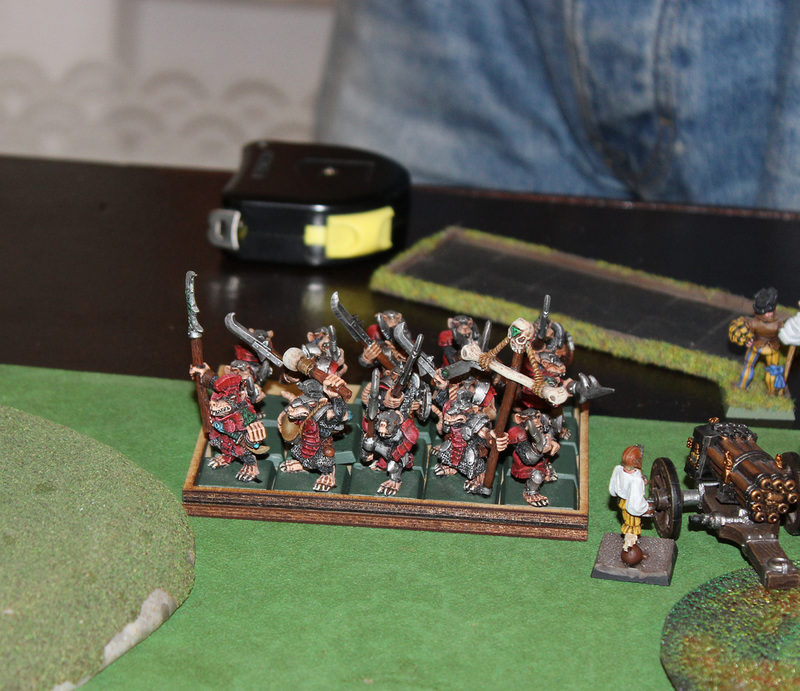 And on the north – Ogres and Militia managed to kill two rats inside Doomwheel. Minor success, comparing to the situation in the middle of the battle. Ogres and Militia fighting Doomwheel. 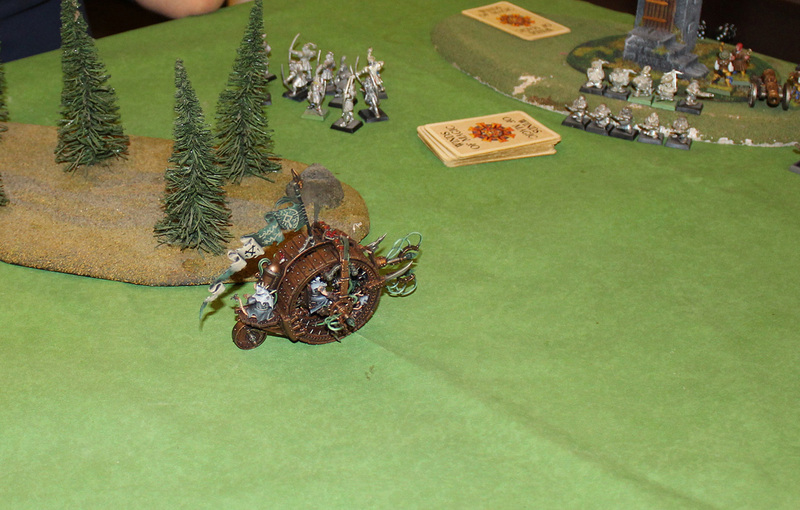 At the same time Stormvermin backed to the battlefield form Rhoden, Slaves turned to face Militia and Ogres regiment, and on the south side Doomwheel was rolling around the small forest back and forth. The Archers were hidden inside and the machine couldn’t get inside the woods – some parts of the wheel could be easily damaged by thick branches. It’s better not to turn the wheel there – just stay outside and shoot lightnings – this is way more better tactics. 2 more archers were zzaped to death. ZZAP! and two more archers burned! Meanwhile Ikit Claw continued his extermination of dwarf-things. He felt disappointment – they also were no match for him. He even had this idea to Skitterleap again to fight Ogres. They could be almost equal opponents for him, but the feeling of disgust and disrespect for dwarf-things were too deep inside to overflight it. He decide to stay here to kill all of the dwarf-things. Only three of them left, but their morale did not break. Count von Stashek order the counter-attack – he and his bodyguard Halberdiers charged Clanrats pushing this hellish Bell. 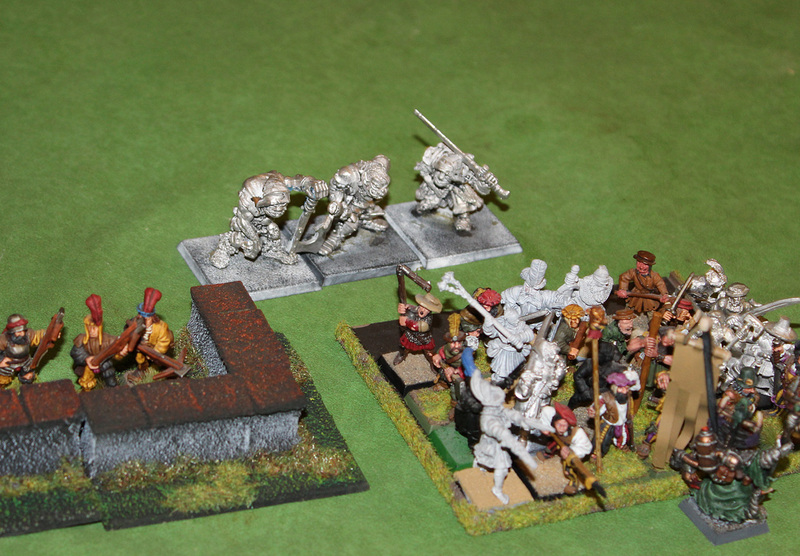 Crossbowmen attacked Slaves from the flank , and Halflings and Archers were releasing their arrows at closest targets. 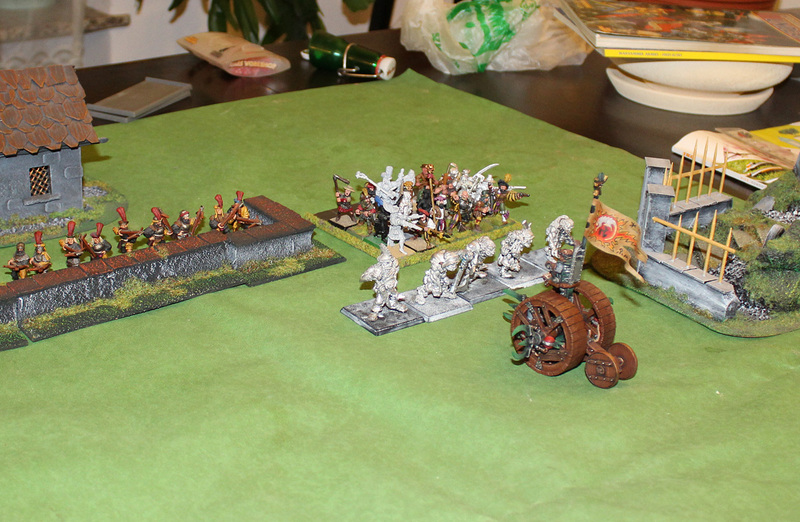 Halflings aimed at Stormvermin (1 Skaven died) and Archers were still hunting for Doomwheel’s driver. Unfortunately their attempts were still futile. Warlock Engineer remained unharmed. Ikit Claw triumphant! Ikit Claw victorious! Ikit Claw Dwarf Slayer! Count von Stashek and his Halberdiers were cutting and slashing Clanrats. Clanrats were no equals to highly trained Empire troops. The halberds were chopping down and down and litres of Skaven blood were spilled today. Totally – 5 Canrats fell down. Their morale broke – and whole unit were forced to flee. Halberdiers were not in position to pursue them – The Screaming Bell and Grey Seer Reezulz The Horned was blocking their way. They surrounded it from both sides. Clanrats flee leaving Screaming Bell behind. Reezulz The Horned was not worried at all about Clanrats escape. Count von Stashek issued the challenge to him – and Reezulz was not like many Skaven Warlords. He did not hide on the top of the bell – he was courageous Skaven – he accepted the challenge and when Count von Stashek jumped on the carriage, Reezulz and his fellow Striker gladly clashed with Empire General. The fight between Count Mathias von Stashek and Grey Seer Reezulz The Horned was fierce and bloody. 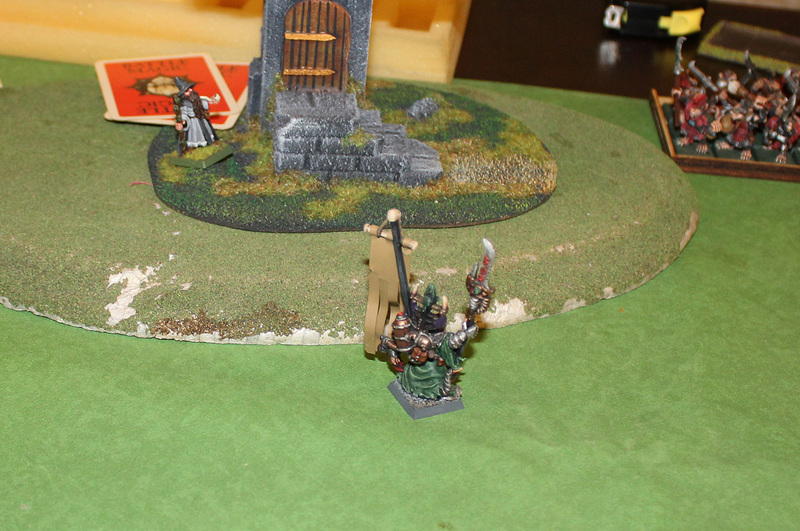 Count von Stashek was swinging his Flail of Skulls, but Grey Seer evaded all hits with grace. He struck with his double handed staff, but his blows were to slow – Count von Stashek easily dodged the staff. But what he couldn’t predict, that The Striker silently sneaked behind Count and struck mighty blow with his Warpstone Hammer. The impact was enormous! The Armour of Protection did not saved the Count and he almost lost his conciousness under the strike of mighty hammer. Reezulz just hissed trough his sharp teeth with satisfaction – puny man-thing general was almost dead. Just one more blow and he will fall. 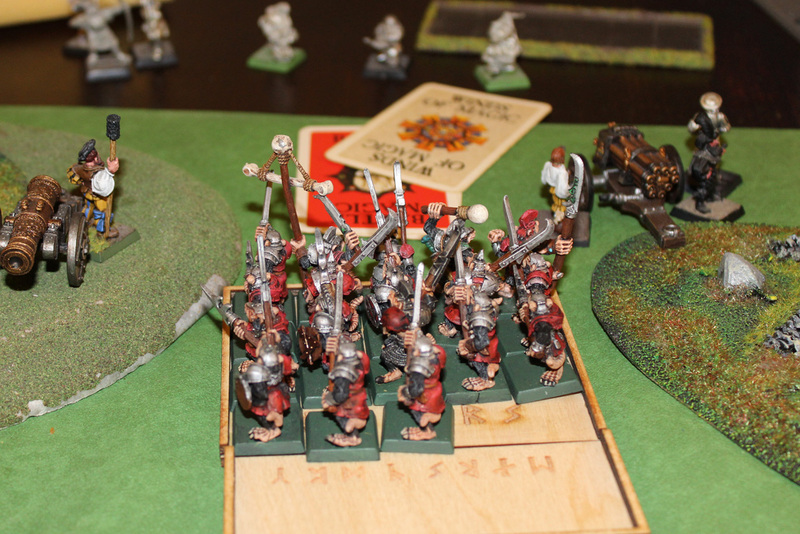 What was also worth to be noted – Ogres and Militia finally eliminated rats from northern Doomwheel. The Skryre machine was right now worthless pieces of wood and metal. At last! …and Slaves charged by Crossbowmen were obviously pursued away. Such weaklings like Skaven Slaves eventually are always beaten and they started to flee. Many things happened later – Doomwheel continued to send lightnings at archers, Clanrats rallied, Ikit Claw moved to the middle of battle, but one moment was about to described in Annals of the Empire – the fall of Count Mathias von Stashek, defender of Rhoden. Count von Stashek was still dizzy after mighty Warpstone Hammer blow from Screaming Bell Stiker. He swung Flail of Skull, but wounds he received probably affected his fighter skills. He failed to hit Grey Seer like a young callow squire. In return Reezulz The Horned knocked him down with his massive wizard staff blessed by Vermin Lord himself. Count von Stashek, Empire General fell down without any move. Empire regiments started to flee in panic. Rhoden was left defenceless. The second Battle of Rhoden was lost. Empire general killed in the challenge by Grey Seer. 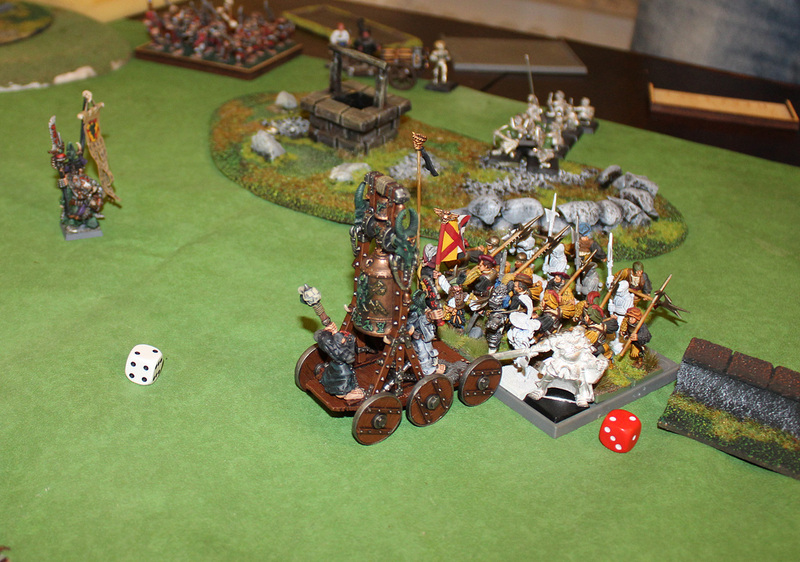 Well, what can I say – if in my battle against Bretonnia my bad luck was just epic, so here Mateho took in all the cursed dice. His three misfire rolls on his Imperial Cannon during the battle (it did not shoot not even once!) will become legendary. And mine on the other hand were extraordinary. The balance of wargaming nature has been restored, uff! What a relief (at least for me, not Matheo…). And I was super lucky I got this annoying (for my opponent of course, not for me) teleporting spell – Skitterleap for Ikit Claw. In 5th edition it was possible to teleport direct into combat. Skitterleap and unbreakable Ikit Claw equals super powerful combination. Nice one dude – OldHammer for the win! hi! thanks a lot! for me 4th/5th edition is like back to my youth days so to be honest I prefer it over 8th edition (not mentioning AoS:) do you have some photos of your Greenskins somewhere to see? Just read this. Really good work. I like the idea of 3rd Edition, but 4th is more to my style. So it is good to see someone playing 4th/5th but with a proper Oldhammer mindset instead of blindly following the army books. Adding in what you want from 3rd is a nice touch.